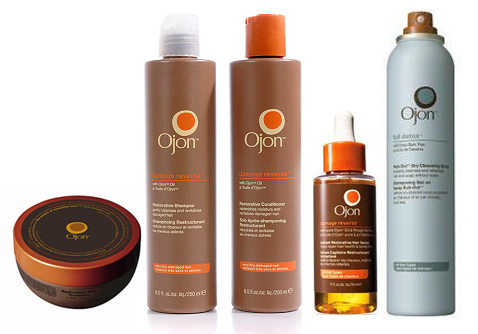 An Ojon Hair Care Extravaganza | Bright & Beautyfull! Oh, man, I hate moving house. In the spirit of this disordered thinking, I decided to do a hair treatment, because, why not have beautiful hair in the midst of the madness? The first time I used the Ojon™ Restorative Hair Treatment (€36/£32.50/$33 for 100mls) I was a’skeered. My ‘blonde’ hair is often at that critical juncture of ‘oh crap the highlights are fading’, and when I got a goo at the deep brown-ness of this stuff, well, cue the fear. Because it is my job to get over this sort of thing, get over it I did. The treatment is the consistency of butter that has been taken out of the fridge half an hour ago: not entirely malleable, but not melting all over the place, either. Not until you get it in your hot little hands, that is. Once you warm it up buy rubbing it between your palms, it becomes soft and liquid, and then you rub it all over your head. It feels especially good on the scalp, and on the very dry ends of my barnet. I’ve completely lost track of how long I’m meant to keep it in, because I forget it’s there, which is an excellent sign of its lightness. There was no indication that the brown-ness translated to my tresses, and in fact, they come out nice and shiny. I am following it up with Ojon™ Damage Reverse Restorative Shampoo (€20.40/£20/$24) and Restorative Conditioner (€23/£21.50/$25) These got a lukewarm review from me here; I stand by that but I have to say, I feel that the S&C actually work better when used as a follow up to the treatment. Finishing it up with Ojon™ Damage Reverse Instant Restorative Hair Serum (€26.50/£22/$24) would be ideal, but I have to say, this is where I cut ties with the brand. It may be that my hair is too fine in texture to handle this stuff. I have tried the absolute eeniest, weeniest measure and it weighs my hair down like one of those hair waxes (of which I am super a’skeered.) However! When I use it as a treatment on my dry hair, it is magic. It smells good, and it sleeks down those split ends without turning them greasy. Finally! As tomorrow is a horse day, and there is no point in washing my hair, I will give my roots a freshening spritz with Ojon™ Full Detox Rub-Out™ Dry Cleansing Spray (€20/£18/$24); for words on this product, see here. And the bonus is that I don’t have to pack the container of the hair treatment, because I used it all up! Woo, boy, that is a great relief, as the 100mls tub won’t be weighing down the next random box I pack! Surely, that would have been the straw that broke the camel’s back! ← Day Cream v Night Cream: Ah Ha! Pingback: Mark Hill Salon Professional and The Hair: Long May it Wave « Bright & Beautyfull!